My daughter would eat breakfast all day if I let her, so I try to occasionally incorporate breakfast into her lunch. Eggs really get a bad rap. They have nutritional benefits, especially if you can get local yard eggs (what most would think of as cage free, but the cage free term is misleading. Chickens only need to have access to the outside, even if its a measly opening in the giant coop.) Eggs offer protein, vitamins, minerals and iron. Yard eggs also are a good source of Omega-3. OK, enough about egg benefits. 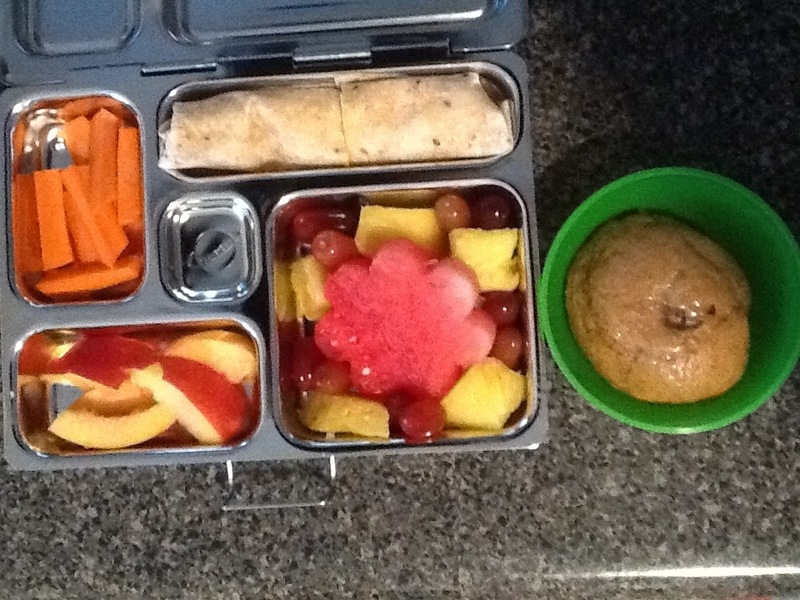 Today’s lunch box contained a scrambled egg wrapped in a whole wheat tortilla with a little Earth Balance “butter,” watermelon flower on bed of pineapple and grapes, fresh peach slices and carrot sticks. The yummy treat is a pumpkin donut for her snack. The recipe is here. See other lunch box ideas. 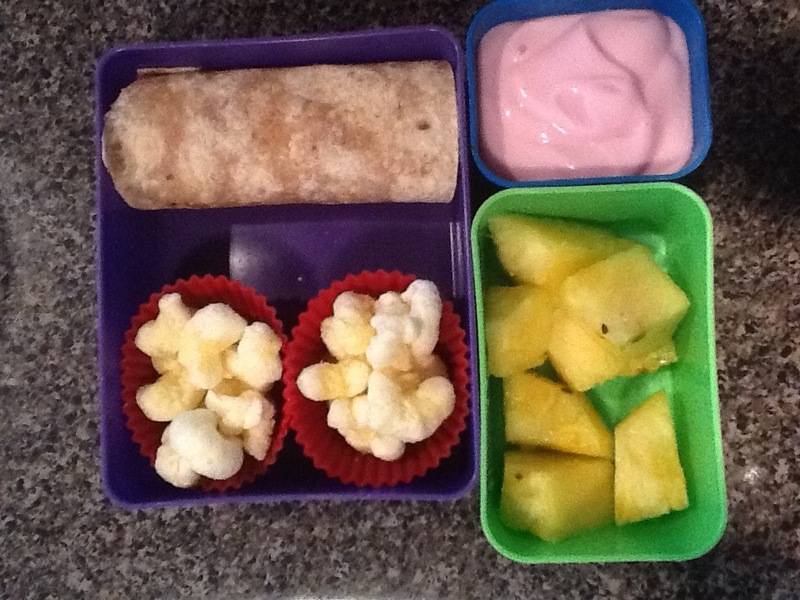 Keep checking back daily for more healthy lunch ideas. I forgot to post yesterday’s lunch. Such a busy day! I think it was her favorite lunch – breakfast for lunch. She LOVES breakfast! 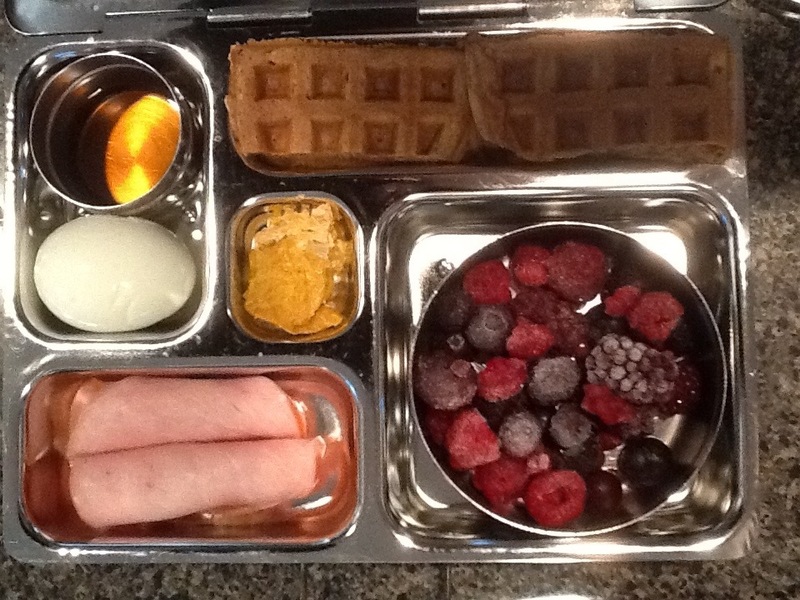 I packed her pumpkin waffles, maple syrup, boiled egg, Canadian bacon rolls and mixed berries. Pumpkin waffle recipe here. They are soooo good. 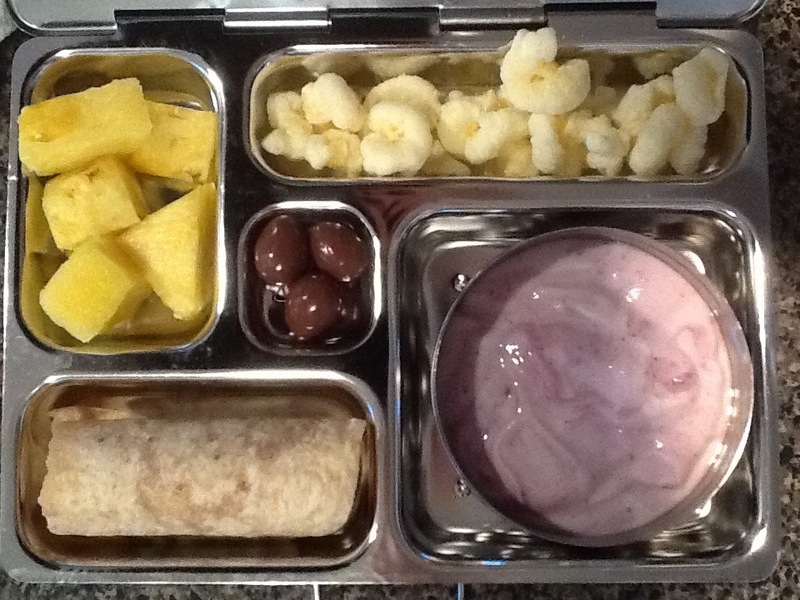 Today’s lunch was by request, it was a peanut butter and banana roll up, blueberry yogurt, pineapple and Pirate Booty. Pirate Booty you ask? It’s an all natural “popcorn” style snack with aged cheddar cheese flavor. Pretty good and no icky stuff, even if it is processed, but it’s an occasional treat so I don’t fret. Oh her little treat is chocolate covered almonds. My son had the same only strawberry yogurt and no chocolate covered almonds. 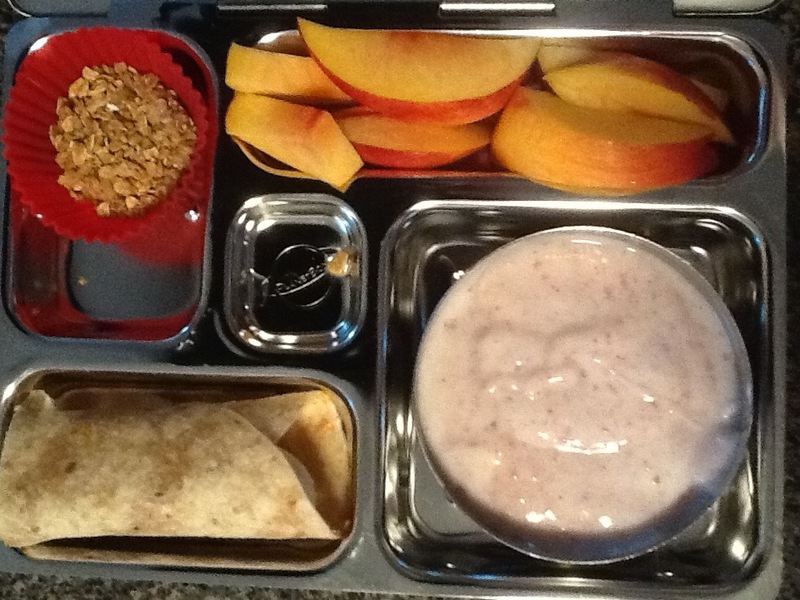 Today’s lunch is yogurt with granola, nectarine slices, and a peanut butter and banana roll up sandwich. I had planned on a hard boiled egg as well, but she opted to eat it for breakfast with her whole wheat pancakes. Her snack is a fresh plum. The banana roll up is easy to make. I grabbed a whole wheat tortilla, spread peanut butter all over it, placed. A banana in the middle, then wrapped it all up. Last night we used some leftover chicken in quesadillas. Today we packed the rest in our lunch box. I’m a little jealous there was not enough for me to have some for my own lunch! Leftovers are a great thing to utilize in the lunch box. My daughter even loves cold lima beans or peas in her lunch box. Ever eat cold pizza? Toss it in your child’s lunchbox and you will be a hero. If you make yr own pizza sauce, you can hide some really nutritious foods in there like spinach, peppers and onions. Anyway, on to the lunchbox. 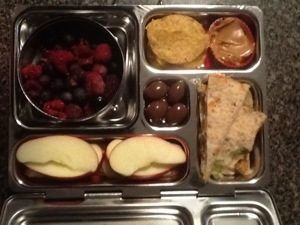 My daughter had the chicken fajita quesadilla, sliced apples with peanut butter, mixed berries and some tortilla chips. Oh, and some chocolate covered almonds for a treat. I tossed the apple slices in orange juice and let sit for about 10 mins, slightly rinsed with water and patted dry to help prevent browning. 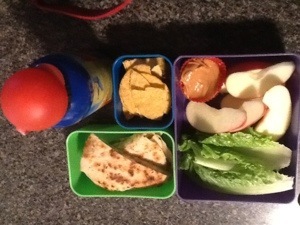 My son had the fajita quesadilla, tortilla chips, apples and peanut butter and romaine leaves in his box. He just likes plain leaves, no dressing… Hey whatever, right?